This is a lovely spring salad that is filling enough to stand in as a complete meal. 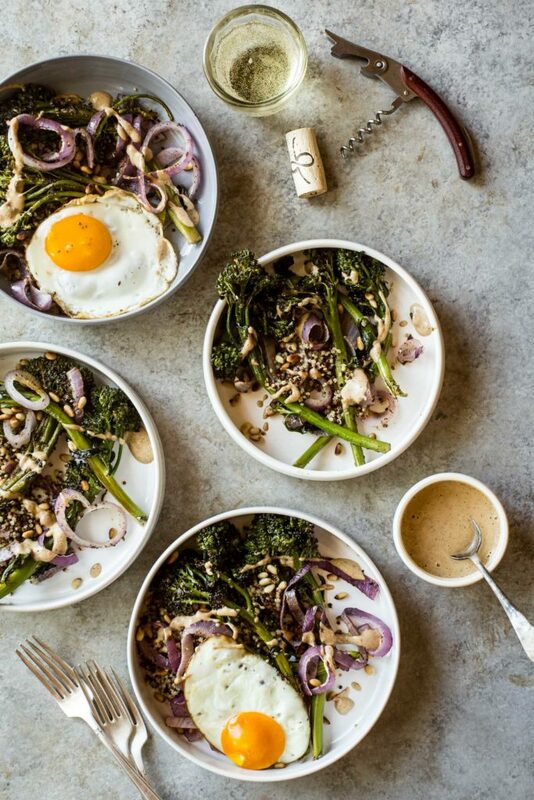 Between the quinoa, roasted veggies, fried eggs (optional), toasted pine nuts and the creamy sauce this is one heck of a meal. Taylor and I enjoyed this for dinner with some rad wine from Analemma Winery (if you visit the area please check them out because their wine and tasting room is amazing!) and a few hungry neighbors who joined us for dinner. I love how quickly this meal comes together while still feeling indulgent and special. The combination of flavors and textures is what makes this salad really special, so be sure every forkful has a good helping of the roasted veggies, quinoa, pine nuts, egg and plenty of sauce. I hope you all enjoy this simple meal as much as we do. Pour a glass of wine, invite the neighbors over, and enjoy the simple flavors of the season. Prepare the sauce by combining all the ingredients and whisking until completely smooth. This works best with an emersion blender or small food processor. Taste for seasonings and adjust as needed. Preheat the oven to 450F. Toss the broccolini and onions with olive oil, za'atar and a sprinkle of salt. Roast in the oven until crips tender and lightly charred. About 20 minutes. Toss the veggies halfway through cooking. While veggies roast toast your pine nuts in a small dry skillet over medium heat until lightly browned. About 3 minutes, while shaking the pan often. If serving with eggs, fry your eggs in a little butter or oil to your desired doneness. Divide the quinoa between bowls and top with an equal portion of the roasted veggies, pine nuts, eggs and drizzle with plenty of the sauce. Season to taste with salt and pepper and enjoy. this. was. so. good. I think I want to make everything on here.